This salad is easy to make and healthy too. Canned salmon is something that I’m starting to use more often. It is very tasty and much cheaper than fresh or smoked salmon. I know the canned variety comes with some bones and skin but the bigger bits can be easily discarded. Any remaining small bones are pretty undetectable when you eat the salmon – although if you have small kids then you might want to use canned tuna instead. To make the dish in the photos I used a brown rice & quinoa mixture because that is what I had in the pantry. 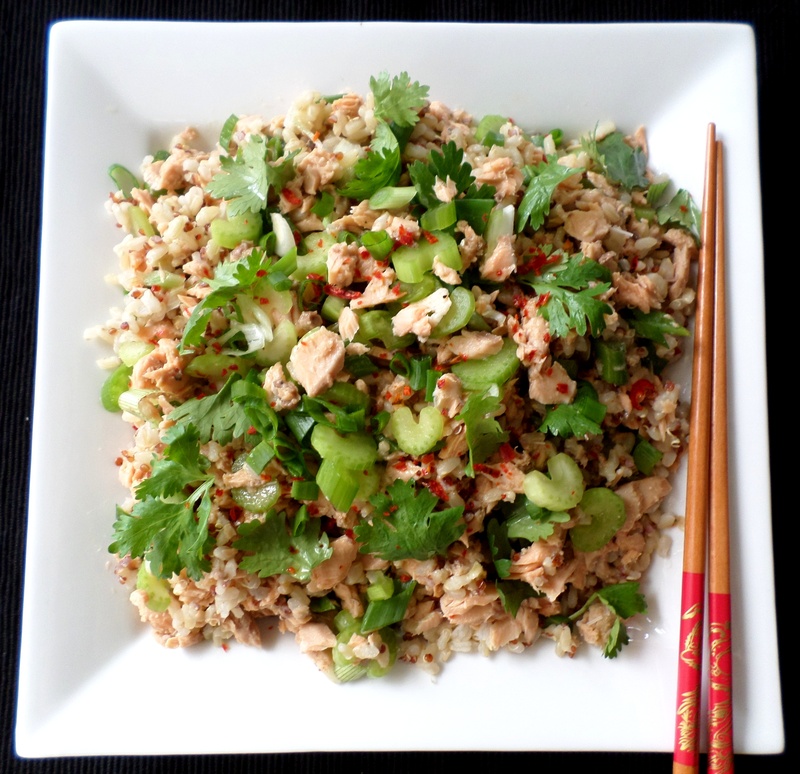 The recipe would work well with plain brown rice or long-grain white rice instead. Use basmati rice if you are trying to eat low-GI. Put the cooked rice into a bowl and set aside to cool. Once the rice has cooled, put it into a large bowl and use a fork to separate the grains if necessary. Add the celery, spring onions and salmon. Stir using the fork to break up the salmon pieces until nicely flaked throughout the rice. 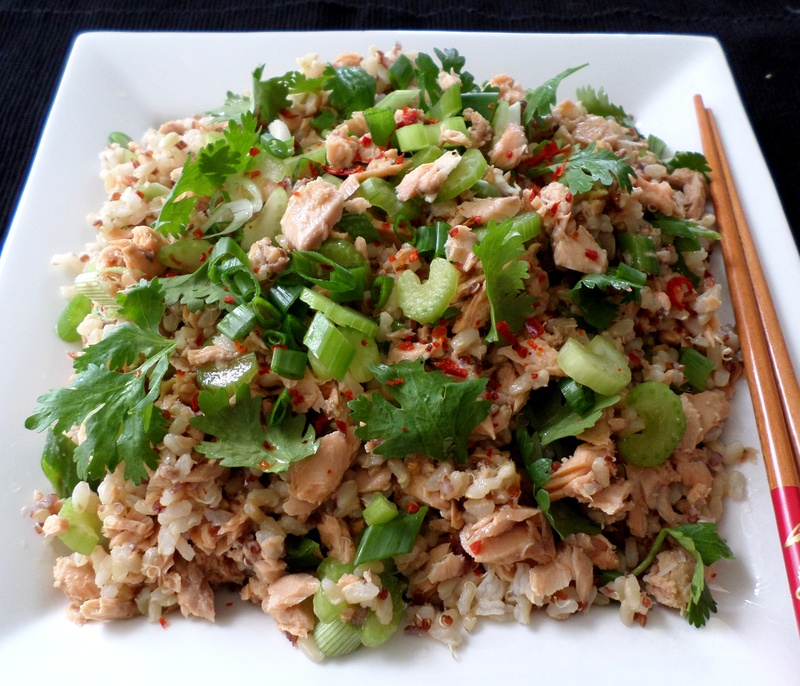 Transfer the rice salad to a serving plate. Mix the dressing ingredients in a jar or small jug. Drizzle the dressing over the top of the salad. Scatter over the fresh coriander leaves and finely diced red chilli. 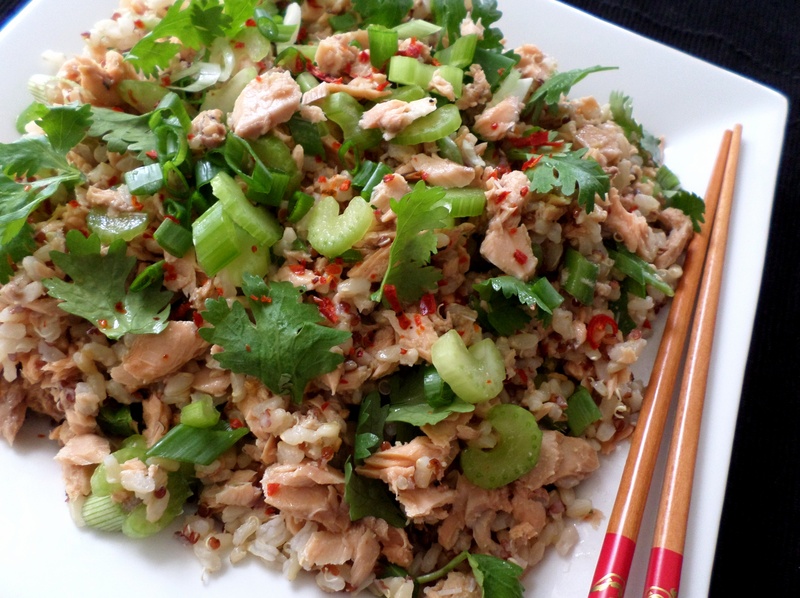 This entry was posted in Mains and tagged Asian, Fish, Food, Light meals, Lunch, Recipe, Recipes, Rice, Salad, Salmon, Seafood. Bookmark the permalink.